I am excited that Kid's Clothes Week is here! I managed to do some planning and cutting last week so hopefully I will have a productive week! Eiffel Tower fabric. I thought it would make a fun dress for Miss Ladybug. It matched the theme so nicely that I couldn't leave it behind. I whipped up a quick Butterick 5776. To make sure that it would be short enough to be a good play dress for Ladybug I cut the size five but shortened it to the size three dress length. I didn't add the elastic to the sleeves because I love flutter sleeve look I get when I leave the elastic out. While I love the fabric the dress was a bit plain without any embellishment so I opted to finish the hem with some pink bias tape. Hopefully the sun will come out later in the week so I can get some better pictures! Ladybug's mom likes this style of dress for play. 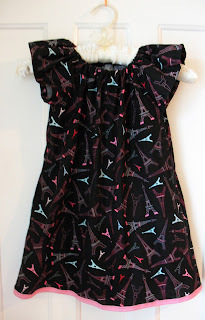 Anybody have any other ideas of dresses that are nice for the active preschool set?